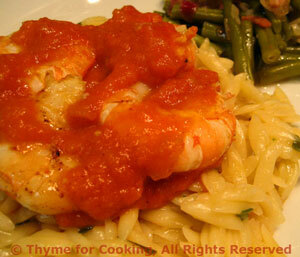 Grilled Shrimp, Pimiento Sauce, Thyme for Cooking easy gourmet dinner. We'll be using the Pimiento Sauce on the Shrimp tonight and the Patatas Bravas tomorrow night. As all we are cooking in the grill is the shrimp, it's optional. Add a bit of time if you have to clean the shrimp. The Orzo is made 'risotto-style' for added creaminess. The shrimp could also be quickly sautéed. The Pimiento Sauce is enough for 2 dishes. Mix garlic, paprika, lemon juice and oil in a bowl, whisking well to combine. To cook on barbecue grill: either put shrimp on skewers or cook in perforated grill pan with a little olive oil. Either method: cook for 3-5 minutes - until shrimp curl and turn opaque. When done, remove from heat. Heat oil in small sauce pan over medium heat. 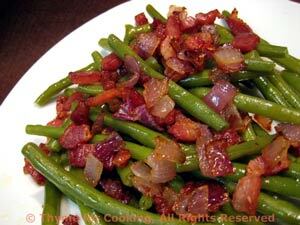 Add chili powder, shallot and garlic and sauté until tender, about 3 minutes. Add the remaining ingredients for sauce and bring to a boil over medium heat. Purée with blender or immersion blender. Save half or a bit less of the sauce for another use. Put orzo and stock in small pan and bring to simmer on medium heat. Turn heat to medium - low, and simmer until done, stirring occasionally, 15 - 20 minutes. All stock should be absorbed, if not, drain. Add a bit of water if it gets too dry. Divide the orzo between 2 plates, arranging nicely. Spoon 2 - 3 tbs of sauce onto each mound of orzo. Arrange the shrimp on the sauce. Drizzle the shrimp with a bit more sauce and serve.